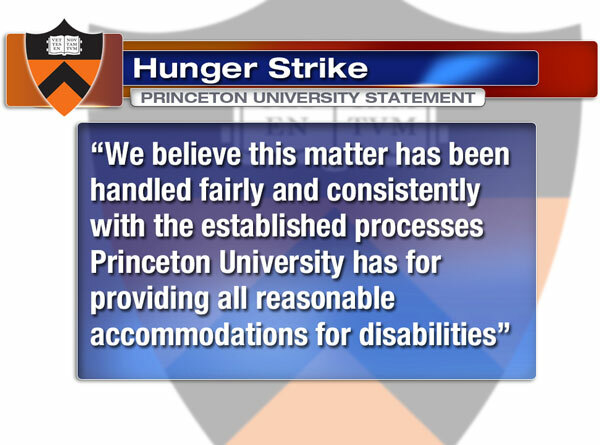 Rachel Barr started a hunger strike May 2 to protest Princeton University's handling of disabled students. PRINCETON, N.J. (WPVI) -- Water, energy drinks, and chicken broth are all that 32-year-old Rachel Barr has eaten in more than a week. She started a hunger strike May 2 to protest Princeton University's handling of disabled students. "I process differently, I perceive differently," Barr said. Barr has dyslexia and attention deficit disorder. She was on full scholarship at Woodrow Wilson School of Public Affairs in 2014 when she says the university failed to make accommodations during exams. As a result, she got a B- instead of a B+ and was dismissed from the program. "The school removed accommodations that were approved and deemed necessary for me to have equal access to exams and when, unsurprisingly, I didn't perform well, they said, 'you're out,'" Barr said. Barr says she was once told by the schools disabilities director that "disability is not part of the zeitgeist of Princeton." "What I do need to know is that the future Einsteins and Woodrow Wilsons of tomorrow, those with disabilities like mine, have an opportunity to succeed at a place like this," Barr said. The Department of Education has reviewed her case, but not rendered a decision. The University released a statement saying, "We believe this matter has been handled fairly and consistently with the established processes Princeton University has for providing reasonable accommodations for disabilities." Barr says she does not want to return to Princeton as a student, but she wants the university to acknowledge it has problems in this area and change how it handles disabled students. "I couldn't read for three years, four years, so imagine the determination it took to keep trying and trying. Not eating food's not terribly hard considering," Barr said. Barr is under a doctor's care and is posting daily on a Facebook page called Hunger for Disability Rights. She says accommodations for the disabled are a civil rights issue that she's willing to risk her life for.